The white scattered hills in a picture look as the mountain of sugar or the snow collected by special equipment. Actually this biggest in the world the plaster dune field: the national natural monument White sands located in the southern part of the American State of New Mexico (English White Sands National Monument). During the last Ice Age the thawing ices and snow from mountains San Andreas (to the West from dunes) and Sacramento (in the east) washed away minerals on slopes and transferred them down. On this place Otero’s lake was formed. 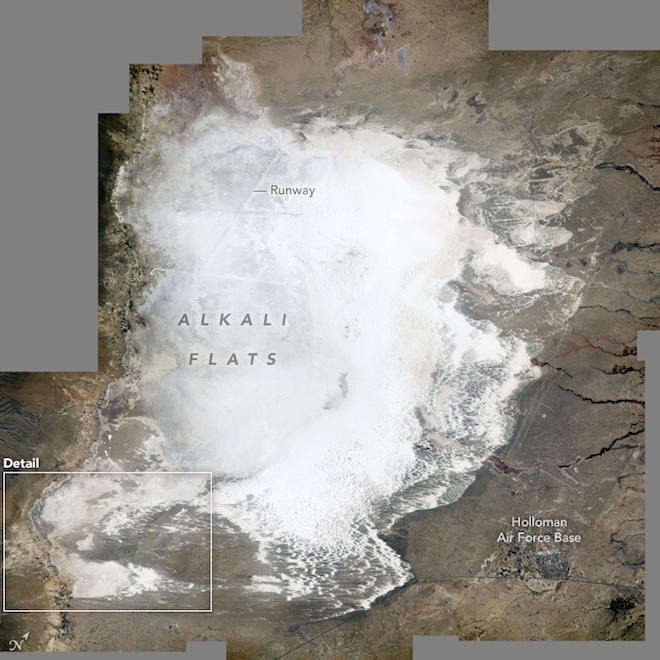 In process of warming of climate water evaporated and the pool was filled with selenit (a crystal form of plaster) therefore the small alkaline reservoir (Alkali Flats) was formed. Over time wind has turned crystals into grains of sand from which the dunes imprinted by the astronaut from an ISS board on June 20, 2016 were created. Today this geological process continues. Mountain waters rich with plaster flow down to the underlying pool where the hot desert sun evaporates water, and winds crush again formed selenit crystals. 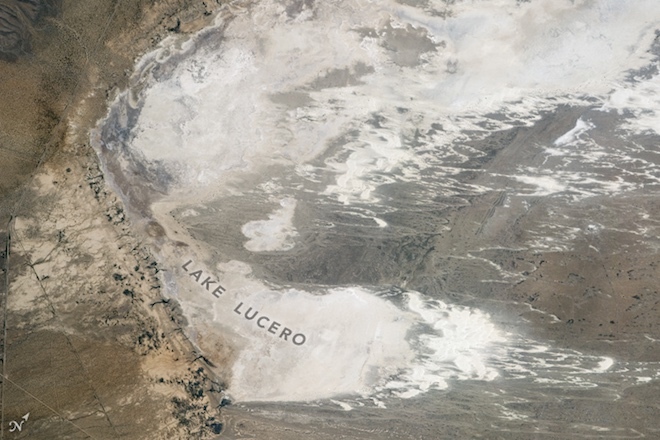 In the southern part of a monument rare rains lead to accumulation of water in the lake Lusero before her evaporation. As the pool has no exit, plaster collects there instead of moving downstream and to be dissolved. The yucca high (soaptree yucca) is one of the few plants growing in White sands. Thanks to big growth to a yucca the unsteady basis isn’t terrible. Locals used her roots for washing of clothes and carpets. At once behind a monument hills are covered with different types of cactuses. Not only plants, but also a number of animals have adapted to dwelling in this plaster desert. Some of them in the course of evolution have got white coloring, having merged with the environment. For example, meshotchaty jumpers (pocket mouse) have lighter fur here, than their fellows in other corners of the planet. Rodents skillfully exhaust water from seeds and can do for weeks without drinking water. One more inhabitant of snow-white dunes — a camel cricket (camel cricket) who is equipped in sands, digging out shelters by means of special thorns. In this area there are two unique species of these crickets and about 40 endemic species of a moth. In the top part of the image it is possible to notice the huge sign “X” which has designated the proving ground of NASA of White Sands Space Harbor (WSSH) where rocket researches and primary training of pilots are conducted.